State-by-state data shows increase in organic purchasing throughout U.S.
Organic food can now be found on the shelves of kitchen cupboards and pantries and in the refrigerators and freezers of more than 82 percent of American households throughout the country, according to Nielsen findings released by the Organic Trade Association. 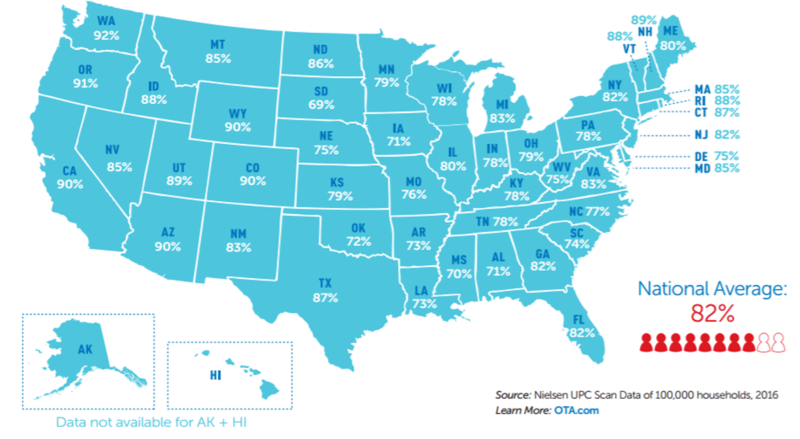 In the first comprehensive look at organic purchases by households on a state-by-state level, 82.3 percent of 100,000 households participating in the nationally representative Nielsen study conducted in 2015 and 2016 reported purchasing organic on a regular basis throughout 2016. That’s up 3.4 percent from 2015. “These new findings show how important organic has become to millions and millions of American families. There are a number of states in which 90 percent or more of households now buy organic on a regular basis, and even the lowest levels all hover around 70 percent. Organic has made a huge inroad into the diets of the majority of U.S. families, and we expect that healthy trend to just keep getting stronger.” --Laura Batcha, CEO and Executive Director of OTA. Wisconsin, where 77.6 percent of participating households bought organic, up 9.1 percent from 2015. Organic food sales in the United States now total nearly $40 billion annually, and account for around five percent of total food sales in this country.